“A teen story? A coming of age novel? Sports? Meh, we’ve seen those,” you say. And so have I! I have read my fair share of high school books, and usually, I find myself quickly bored. To top that off, sports novels have never peaked my interest. Not so with Derek E. Sullivan’s “Biggie”, a novel that gripped my attention and held me until the very end. Biggie is an overweight teenage boy, who has pushed himself to 300 pounds in an attempt to remain invisible at school. He spends his time studying, striving for perfect grades, while managing a slew of online friends. Biggie also happens to be the son of one of the biggest athletes of Iowa, and step-son to the close second. 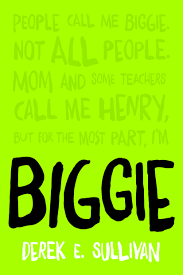 With a lineage like that, everyone expects Biggie to be some kind of big sports hero… that is, everyone except him. When Biggie pitches a perfect game of whiffle ball during PE, the girl of his dreams suggests he should play ball… and he finds himself suddenly obsessed with the idea of pitching a perfect game of actual baseball, on the school’s actual team. Biggie finds himself challenged in every possible way on his quest, making radical changes to his lifestyle, changing his perception about himself, and everyone around him. There are so many things about this novel that make it so compelling. For starters, Biggie, our protagonist and narrator, is smart, insightful, and imperfect. Many of the decisions he makes tend to be the worst possible ones, and though he feels justified in doing them, he is held accountable for his actions. And while his reasoning for wanting to keep his weight over the 300 pound mark seems justified to him, we as a reader are quick to see how unsound it really is. You might find it odd how quickly he throws his entire being into this insane idea of a perfect game, but we are completely aware of avery motivation behind it. Biggie may come off as a coward and a creep at first, but he slowly grows and evolves into someone I wouldn’t mind being friends with. Biggie is a character with depth, but so are the people around him. The ‘bully’ turns out to be much more. The ‘girl’ turns out to be much less. Everyone else who is a part of Biggie’s life is more than just a placeholder or plot device. I loved the growth that they all went through, and how their own growth affected Biggie’s. The evolving relationship between Biggie and his step-father is something quite impressive, but it is really Biggie’s relationship with his peers, in particular with the women in his life, that is the most incredible change. The change in his obsession with Annabel is probably the best mile marker for his maturity. With characters like those, it’s easy to root for them to reach their goals, even if those are *shiver* sports. As I said before, I don’t tend to find novels about sports compelling, but, to my surprise, I actually enjoyed reading about Biggie’s games. As baseball becomes increasingly important to him, it becomes important to us. Which is why I liked the resolution so much; I won’t spoil anything, though, you’ll have to read it yourself. Biggie (Derek E. Sullivan) comes out on March 1st, 2015.